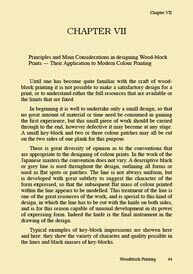 89 pages, 22 figures, 23 Plates - including step-by-step separations of the construction of the woodblock print that was included with the original book (here reproduced in colour). 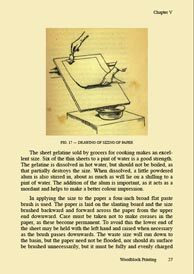 Description: This is one of the earliest ‘How to’ books ever published on woodblock printmaking. 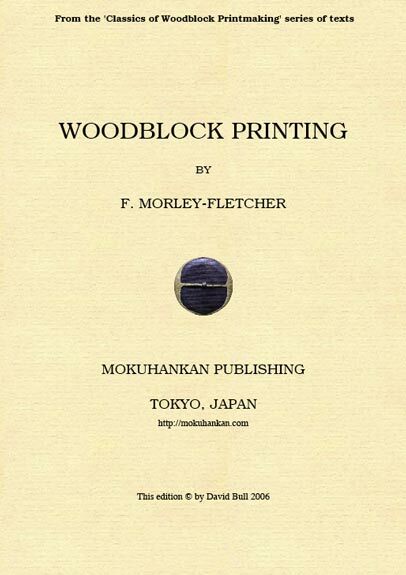 Mr. Fletcher (1866~1949) very thoroughly covers every aspect of the process in great detail, and if you had no other volume for reference than this, you would be able to produce quite satisfactory woodblock prints. 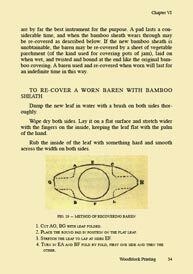 Mr. Fletcher felt it was important to put the knowledge he had gained into a form that would make it possible for others to learn and experiment with colour woodblock printmaking, so to that end he produced this book in 1916. Even though many other sources of information have become available to us since that day, this book still has great value. 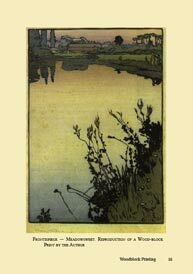 He - and the other pioneers of colour woodblock printmaking in England at the time - were forced by their lack of ‘official’ knowledge into a very much self-directed form of learning. They tried this, and they tried that, and explored the genre with no concern about whether or not they were doing things the ‘right’ way. Even had they actually been better informed, it is doubtful that they would have been able to produce more interesting prints. I am happy to play a part in keeping Mr. Fletcher's work available to aspiring (and practicing) printmakers. I hope you find it useful. About this eBook: The book is identical to the original version published by Mr. Fletcher in 1916; nothing has been omitted. This pdf version also contains a complete set of 'bookmarks', allowing you to jump directly to any section that you wish to read. In addition to these bookmarks, the Table of Contents within the book itself is also 'hot' - clicking on any item will jump you to the corresponding page. To provide even deeper access to the information presented, the entire text of the book is accessible with the 'search' function of your pdf reader.